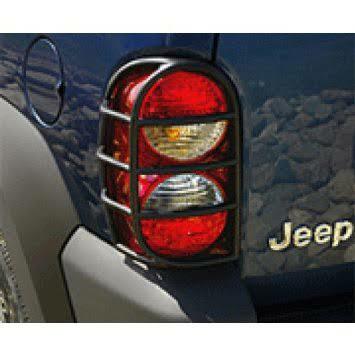 Taillamp Guards for the Jeep Liberty help protect your vehicle taillamps while providing rugged off-road style. Quick and easy installation. Available in Black (PX8). Molded plastic. Sold as a pair. I ordered the Graphite Metallic color thinking it was just an uncoated metal. ugh...its like plastic. I felt like a stooge. It sticks on like a sticker. ConsPlastic and serves no true capacity other than aesthetic. Installation took all of five minutes. I was a little apprehensive that this fit on only with tape. However after applying I found the tape to be strong and sticky enough to ease my worries. The black guards look great on my KJ !! ConsMade of plastic I was hoping they would be metal.